Serge Myrandhal perceived a boundless desert, a kind of red-tinted Sahara furrowed by long rectilinear valleys, trenches of a sort extending geometrically from north to south. Then the landscape was suddenly illuminated, the trenches sparkled, and Serge, his face transfigured, uttered a cry of triumph. "The canals!" he shouted. "The famous canals of Mars! I've arrived!" Published in 1908, the same year as Gustave Le Rouge's The Vampires of Mars, this pioneering planetary romance is the third French Martian epic after Doctor Omega (1906) and Jean de La Hire's The Nyctalope on Mars (1911), written three years before Burroughs began work on A Princess of Mars. The bold French Engineer Serge Myrandhal travels to Mars in a ship propelled by the power of thought, followed by his fiancée, the brave American novelist Miss Annabella Carpenter, and her guardian, the eccentric British millionaire Sir Washington Pickman. There, they make numerous wondrous discoveries including that of a race of small, red-furred anthropoids living underground, and beautiful winged humanoids. 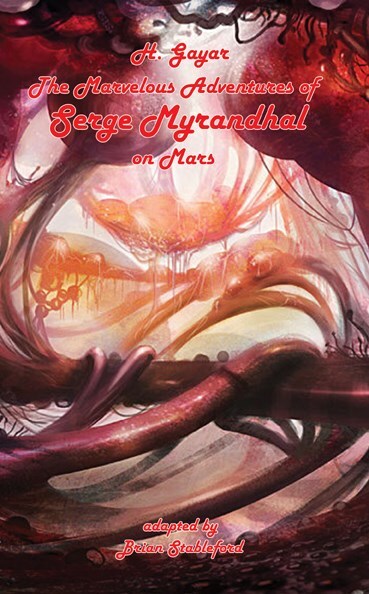 As a specimen of early planetary romance, The Marvelous Adventures of Serge Myrandhal on Mars is of considerable historical interest and remains very readable today, amusing and even thought-provoking.